American rock band The Eagles performing in London. Photo: Reuters. The Eagles’ greatest hits compilation featuring rock classics such as “Take It Easy” and “Witchy Woman” has dethroned Michael Jackson’s “Thriller” as the top-selling album of all time, according to industry data released on Monday. The album, called “Their Greatest Hits 1971-1975,” has racked up sales or streams of more than 38 million since its release in February 1976, the Recording Industry Association of America said. That knocked Jackson’s 1982 pop sensation, “Thriller,” with more than 33 million sales or streams, to second place. The No. 3 slot belongs to another Eagles album, “Hotel California,” at 26 million. The Eagles formed in Los Angeles in 1971 and broke up in 1980. 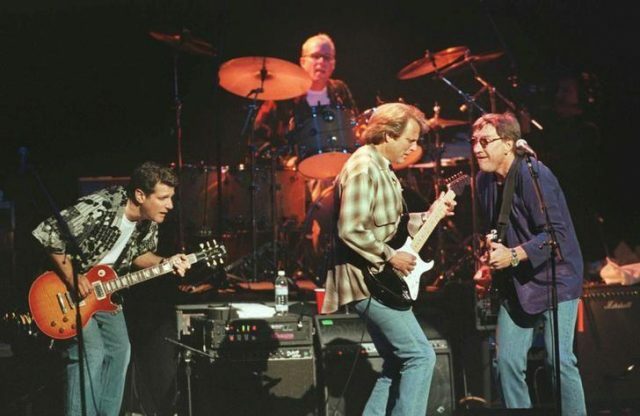 In 1994, they reunited with original band members Don Henley and Glenn Frey. Frey died in 2016, but the band still tours with members who include Henley, Frey’s son Deacon, and country star Vince Gill.